43.2 percent of veterans experiencing homelessness are people of color, compared with 18.4 percent of the general veteran population. 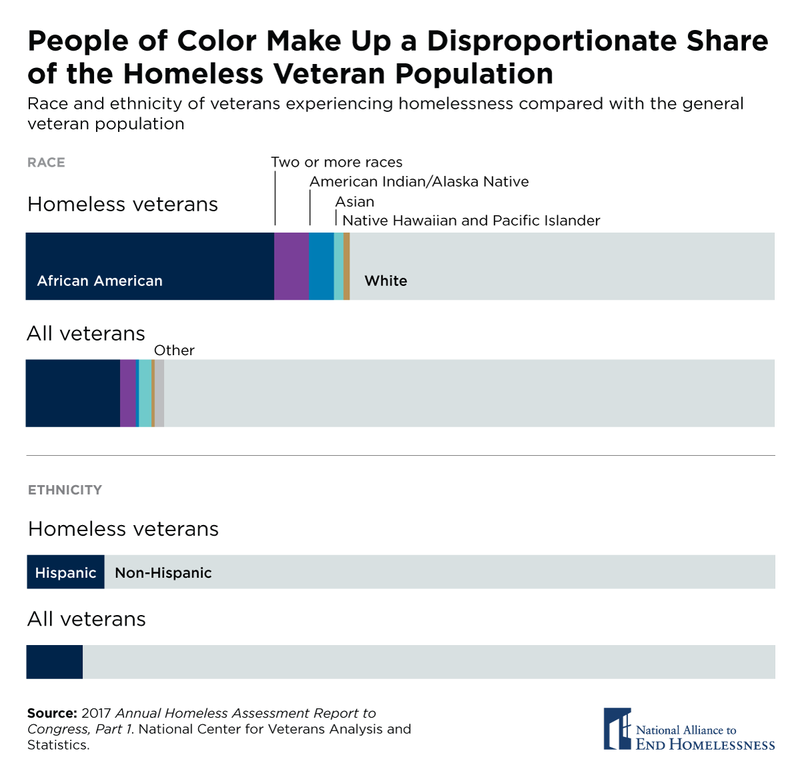 3 percent of homeless veterans are Native American or Alaska Native and 4.8 percent are multiracial, compared with 0.7 percent and 2.1 percent of the general veteran population. White veterans are significantly less likely to be homeless. 56.8 percent of veterans experiencing homelessness are white, compared with more than 81.6 percent of the general veteran population. Ending veteran homelessness requires addressing structural inequities in housing and income that lead to homelessness for veterans of color. The homeless services sector must also be committed to delivering equitable results with their programs. Note: Data on overall 2017 veteran population are a projection based on 2015 data. Source: 2017 Annual Homeless Assessment Report (AHAR) to Congress, Part 1. National Center for Veterans Analysis and Statistics, Veteran Population Model 2016.